In an undisclosed area (as this is a cherished and secret spot of the crew I am following) a figure tactfully and gradually crosses a highline 40 feet above hikers and bikers who remain entirely unaware of the network of ropes and equipment tied around the trees and boulders above their heads. I'm with Ari DeLashmutt, a highlining enthusiast, his wife and some of their friends. "This is a day of highlining," says DeLashmutt, "hours of preparing and setting up the line, about a half hour or so out on the line, a couple more hours to take back down the line and then lots of laughs, campfires, food and fun in between." "I would do it for some root beer," says a Patagonia-puffy clad, 7-year-old River looking out over the highline, a true Bendite in the making. Small but brave, River conquers his fear of the 40-foot drop, to slide across a pulley system in his climbing harness (similar to a zip line) created by DeLashmutt. It's an adapted version of the real thing allowing him and his brother to get a feel for just how high they are. For those unfamiliar with the sport, it is not so different from an outdoor version of walking a tightrope in the circus. It's a kind of love child between slacklining and rock climbing—requiring both balance and strength. Two lines are set redundantly (for extra safety) across sturdy trees, boulders, buildings or whatever else one can imagine as a stable anchor. 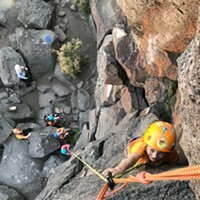 The person on the line is tied in to a climbing harness attached to both lines, so that if they fall their harness will catch them after only a few feet. It relies on one's strength, balance, peace of mind and ability to deal with the exposure of being out on a line. 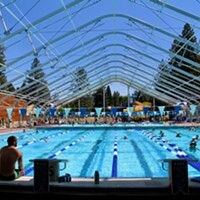 Lines can be set at a variety of lengths and heights altering the challenge. And DeLashmutt has a whole host of places (with varying levels of legality) in Central Oregon he wants to set lines. 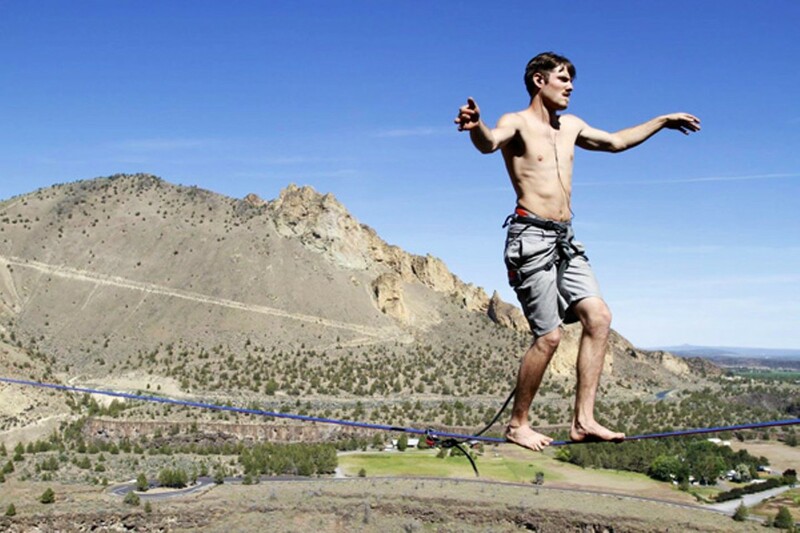 Delaschmutt tells me that worldwide highlining has taken off as a sport in recent years, and, as with so many extreme sports, Central Oregon is a perfect place to do it. In particular, Smith Rock, with its spires and built-in climbing culture, has proven to be an ideal location—and host for the now annual Highlining Festival. DeLashmutt even lists off several friends choosing to move to Bend specifically for opportunities to highline—having begun highlining himself only in September of last year during the Highlining Festival, which brought around 100 highliners to the area. DeLashmutt tells me it's best to learn what it takes to highline and how it works from the experts, but still it's no easy task. It took him three days and an assemblage of nasty bruises to finally make it up on the line. "It's so worth it, though," insists DeLashmutt. "It's not like other extreme sports. It takes a lot of concentration. It is a slow constant struggle. It's very unnatural, but you have to let go of all the doubt in your mind and enter a very meditative state. In the end it feels much more rewarding." "Do you ever meditate on the ground then?," I ask naively. "Nah definitely not," DeLashmutt replies (with more profanity than is quoted), "That's way too boring." LACED UP, AND NOWHERE TO GO!